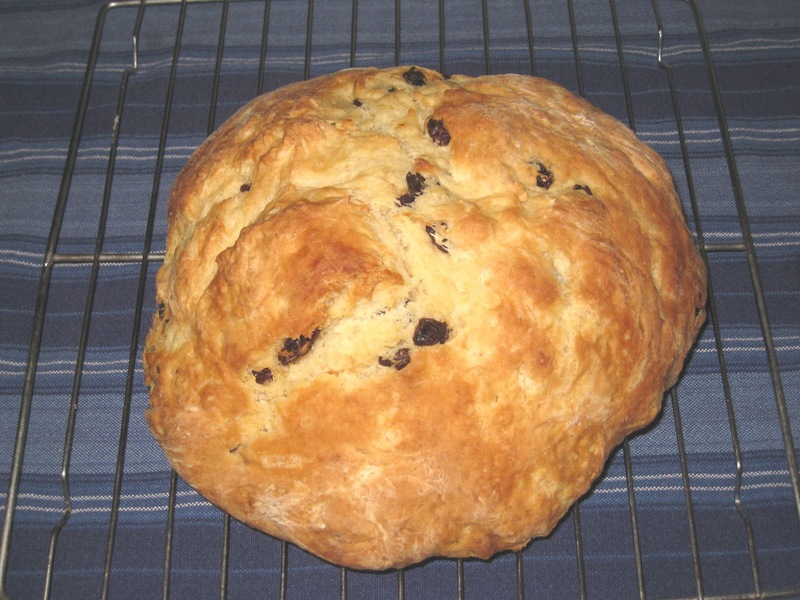 I had intended to make soda bread for St. Patrick's Day last year, but time got away from me and I never got around to it. So I was determined to make it happen this year, and I am so glad that I did! I was not really familiar with soda bread, so I assumed that it was more like a quick bread which, having no yeast, is a lot softer and more cake-like than yeasted breads. But I was wrong. This bread has a dense crumb that is strong without being tough. It toasts beautifully. It is not overly sweet. In a word, it is delicious. And quite easy to make. You mix up the dry ingredients, cut in a little bit of butter, stir in the wet, knead it a few times, mold it into shape with your hands, cut a cross into the top (I didn't cut quite deeply enough so you can't see it that well, but that had no affect whatsoever on the texture or taste), and bake it for 40 minutes. C'est tout. I also like that there are only two tablespoons of butter in soda bread, compared to the half cup you find in scones and biscuits. 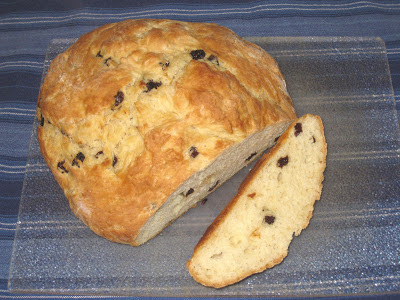 The small amount of sugar, combined with the raisins, gives a sweetness to the dough without being too sweet. I can make no attestation as to the authenticity of this recipe. I looked at quite a few recipes before deciding to try this one and the ingredients were comparable in most of them so I decided to go with this one. It was a wise decision. 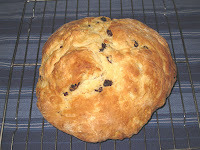 Whip up a loaf or two of soda bread for your St. Paddy's day celebration and your guests will be quite happy. In fact, you should whip up a loaf anyway. You won't be sorry. Preheat the oven to 375 deg. F. Combine flour, sugar, baking soda, baking powder, and salt. Cut butter into flour mixture with pastry cutter. Add buttermilk until dough is soft. Stir in currants. Turn dough out only a lightly floured surface. Knead for 5 minutes or until smooth. Form dough into a 7-inch round. Place on a lightly oiled cake pan or cookie sheet. Score with a cross 1/2-inch deep on the top. Bake for 40 minutes.